Definition of skilled health personnel providing care during childbirth is a joint statement by the World Health Organization (WHO), the United Nations Population Fund (UNFPA), the United Nations Children’s Fund (UNICEF), the International Confederation of Midwives (ICM), the International Council of Nurses (ICN), the International Federation of Gynecology and Obstetrics (FIGO) and the International Pediatric Association (IPA). 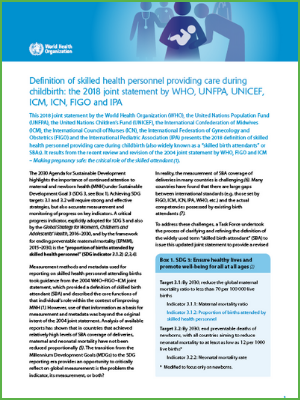 A background document, Defining competent maternal and newborn health professionals, outlines eight categories of maternal and newborn health (MNH) competencies that professionals must process as an integrated team, while focusing in particular on the competencies of the MNH professional providing intrapartum care. This document and the new joint statement also link the competent MNH professional with the enabling environment comprising the six building blocks of the health system – service delivery; health workforce; information; medical products, vaccines and technologies; financing; and leadership and governance – which are essential for effective, timely, continuous, quality care. Below you may also find the web appendix, Mapping of WHO competencies for the maternal and newborn health (MNH) professional based on previously published international standards.